“Protests in Daraa-Syria”; When I read this ticker in my favorite news channel, I can’t honestly say I did not feel goose bumps. As a Lebanese, anything that happens in Syria directly affects my country and probably the entire geopolitical (dis)equilibrium that has characterised the Middle East since the last Israeli-Arab wars of 1973. Four days after the Daraa spark, I counted twelve cities where unrest was happening. Busy with the very rare YouTube videos and the inevitable contradictory death toll, news channels forgot to analyze the essential question: what next for Syria, and what about the impact on the region. Syria is not Egypt and even less Tunisia. In these two North African countries, the revolts featured distinctive social demands: jobs, a future and freedom. In Syria, these three basic demands are complicated by an extra sectarian flavor. Syria’s 75% Sunni population is ruled by Bashar Al-Assad’s Alawites who make 10% of the population. Social demands mixed with sectarian unrest ia a usual recipe for disaster: a special kind of one, civil war. Daraa is an interesting city for the start of the revolution. It is close to Damascus, and its population is a mix of Sunni, Alawites and Druze. As anyone who has ever lived through civil war would tell you, trouble always starts within mixed areas which act as point of frictions: living side by side with the 'other' ferments jealousy, anger and hatred. Daraa exploded, Aleppo and Lattaquia followed; two other highly mixed cities. The Sunni citizens of these towns are usually more religious, and have more reasons to imitate their Egyptian and Tunisian Sunni “brothers”. The first reaction of the regime has been to bring down to the streets the pro-Assad protesters, and contrary to Egypt’s Moubarak or Tunisia’s Ben Ali, the Syrian regime does have real supporters: the Assad’s own Alawites, but also most of Syria’s Christians and Shiite minorities. The Druze community- well advised by their cousins in Israel and Lebanon- will probably wait to see how things turn before taking a stand. I remember long talks with my Syrian friends, telling me how many of the Alawites from Lattaquia for example, were armed by the regime, and how the roads between Sunni dominated cities and others were on purpose never fully operational: call it “trouble insurance”, but the regime has always been prepared for when that “Sunni” pride day would come. The regime and its supporters are very aware that a “simple” change of power will not – and cannot- happen peacefully. The only way out is probably war, civil war. While that civil war scenario is – in my opinion – the most likely, three others exist. In the first, and as the protests gain momentum, the Alawites tribal heads could decide to drop the Al-Assad family. Fearing for the future, these traditional leaders – who also lost part of their power at the hands of the ruling family- might conclude that joining the protest momentum is the best way to “protect” the community. The Christians and hesitant Druze groups would then be forced to do the same. The domino effect would then be terminal for the current regime. In the second, the Syrian regime analyzes that most foreign countries have no interest in seeing the regime fall, and cracks down on the protest the hard way, the Hama way. In 1982, Bachar Al-Assad’s father had ended a similar revolt by killing an estimated 5,000 people. Most countries remained silent, as Syria’s stability was –and still is- a guarantee for all the countries in the region. Al-Assad will then be free to break the revolt. But in 1982, there was no Facebook, Al-Jazeera or Al-Arabiya ; information is the enemy of dictatorships. In the third, Al-Assad decides that dropping Iran and getting close to Saudi-Arabia is his best bet to “calm” Sunnite protests. While the regime will probably try this path – as early reports of last minute meetings between Saudis and Syrian leaders show – it is doubtful that it will impact or calm the protesters. The Syrians might find this path to be a dead-end. The rest of this article analyzes the regional impact in case the civil war scenario does unfold. Part of the proof lies in an unnoticed tweet by BBC’s correspondent in Syria – Lina Sinjab – she reported that protesters had arrested Iranian and Hezbollah operatives working alongside the Syrian security forces. Syria is Iran’s best friend in the region and the main conduct for Iranian weapons to Hezbollah. Iran can simply not afford to lose the Al-Assad regime. As the BBC Tweet showed, Iran will spend the right amount of money, effort and men to keep the Syrian regime alive. On the other hand, Saudi Arabia will not accept to sit down and watch its arch-enemy Iran take over Syria. The Saudis will probably send weapons and support to the protesters. Syria would then – ironically- become a new Lebanon (not the other way around) and fall into civil war. - Reconciliation between Hamas and PLO in Palestine: the changes in the region will weaken both their sponsors, and drive the Palestinian people to request more from their leaders. Both Hamas and PLO leaders might have no choice but coordinate. - Depending on how things turn out in Syria, Iran will have to choose between either 1) negotiating with the Saudis and Americans, or 2) going full speed with a destabilization of the region: and eventually a regional war. - Iran’s repositioning will impact Hezbollah’s choices: 1) Use its weapons to negotiate a constitutional settlement that favors it, or 2) Decide that taking over Lebanon is its best long term choice, before losing its vital Syrian weapons conduct. Lebanon’s civil war could then get re-ignited, and the country heading towards a de-facto federation. - Saudi Arabia’s Shiite community will be pushed by Iran to stand-up to the Monarchy. Expect more trouble in the oil rich – and Shiite dominated- eastern region of Saudi Arabia. - Israel’s best interest would be to wait and see how the events turn out. But as Lebanon’s civil war history has shown, anarchy at Israel’s borders increases the possibility of “independent” groups firing rockets at Israel. The Israeli reaction might further put pressure on the Israeli government to “act”. In all the scenarios, the region is bound for some tough times: nothing new in the book’s cover, but all new in its content. Your analysis is overly pessimistic; or maybe because I am Syrian, I cannot afford not to be optimistic. I really do not think that the sectarian divide in Syria is as deep and entrenched as it remains in Lebanon. In the last decade there Sunni who have benefited from Bashar and like the status quo whereas others from the minority sects, including Alawis, who are dissatisfied with Bashar. As someone who has spent most of my formative years in Lebanon, I can say that, unlike Lebanon, a large percentage of Syrians see themselves as Syrian first and consider their sect as their secondary identity. 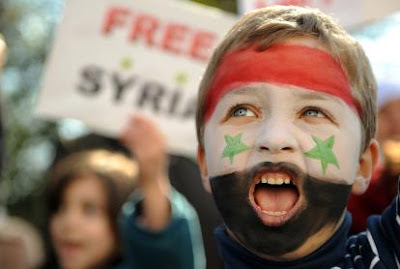 I agree with you that Syrians have more national pride than many others in the Arab world! And certainly more than Lebanon. 1) Unfortunately sectarian divides are always hidden. Fear can wake up many demons. 2) My analysis is a scenario analysis. I am not saying this will happen, but more a what if analysis type. I would also add concerning Daraa, that it is a "tribal" (a3chair) based city: that is important in the analysis also, as when a3chairs start revolting in the Arab world, the whole structure is shaken.